R. G LIVES NEXT DOOR -- or down the street -- in a modest home that could probably use a coat of paint. He drives a 9-year-old car. His kids may play soccer with your kids and he sometimes watches football on Sunday. But there's a big difference between you and this neighbor. Mr. G makes more than $100,000 a year in a criminal enterprise. He grows marijuana. Of course he has another name. We chose "G" for green, the color of the product he turns out, and "G" for grower. Mr. G is the one you read about in police reports when he is busted for growing marijuana in a spare bedroom in downtown Eureka, Arcata, Fortuna and other urban and suburban neighborhoods near you. "There are many, many small indoor operations throughout Humboldt County," said Mark Harris, an Arcata attorney who specializes in marijuana defense. "It is much more pervasive than people realize -- at least people who don't grow or use marijuana. It could be the butcher, the baker, the candlestick maker. These are people from all walks of life. 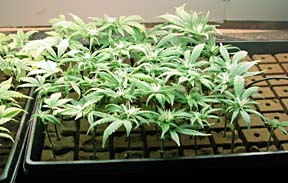 At every level from blue collar to professional, people can have 10 or 20 plants in a closet under a couple of lights." Walking in the front door of Mr. G's house you are struck by the smell -- not the smell of marijuana, the smell of bacon. He has just cooked breakfast for his clipping crew. As they return to work he gathers the dishes and leaves them to soak in the sink while we sit down to talk about business. G has been a pot smoker since he was a teenager. Over the years he dabbled in outdoor growing and small scale sales. "At one job site I was working on I had access to neighboring woods," he said. "My work kept me returning to the area, so I would go after work, before work or during lunch hour, and tend to a small garden. It never amounted to much, just a few thousand dollars. It was a nice payoff at the end of the year for very little work. But what I'm doing now is on a different level." 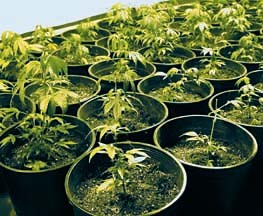 Mr. G said his business is part of a local trend in part brought about by CAMP -- the Campaign Against Marijuana Planting. "There are obviously still plenty of outdoor growers, but you can't grow in the full sun any more and that's what produces the really good buds. It's rare to get outdoor [marijuana] today that has been grown in full sun. People have to grow under the trees to avoid detection from the air," he said. "And the outdoor grows have become more labor-intensive. People used to use backhoes to plant football field-size pot patches. That's definitely not happening. The outdoor grows have generally gotten smaller." Humboldt County Sheriff Dennis Lewis said his officers do a pretty good job on interdiction when it comes to outdoor marijuana grows. He said he believes the annual raids remove a large share of what is grown outdoors from circulation. But it's a different story when it comes to the expanding number of indoor operations. "When you factor in the indoor grows, I don't think we do get the majority," he said. "These indoor operations have been increasing for a number of years," said a Fortuna police officer who handles controlled substances investigations for the city. "It's a profit-motivated business. They can do it year 'round. Here in Fortuna we're seeing larger operations and at least a few people who have moved here from out of the area to do this. People are moving here because it's widely publicized that Humboldt is the mecca of marijuana." How do the police discover indoor grows? "A lot of times we hear from citizens who are concerned about what's going on in their neighborhood," said the Fortuna officer, who wanted to remain unnamed for this report. "People who find something out whether they stumble across it, or someone doing it is bragging about it." Sheriff Lewis said, "We have our eyes, we have our ears, we have our noses. Sometimes we find marijuana by accident." You might think that a marijuana factory in a spare bedroom would be an easy thing to detect because of its pungent odor. That was one of G's primary concerns when he set up his indoor operation. "The first thing you do is you go in there and deal with ventilation," he said. "You build a system that draws fresh air in and hot air out. It's ideal to have some sort of filter so the smell of flowering marijuana doesn't fill up the whole neighborhood." Once the ventilation is in place, "It's just gardening." "I do it just like you would outside, except I have an artificial sun. You hang a few lights, then you decide whether you're going to go hydroponic or with soil. In my case I use soil. It seems to be more forgiving. I can water the plants and walk away. I don't have to worry about the ph balance being just right. "Sometimes you need to look at the wiring in your house. A lot of times with operations like this, people will catch their house on fire because they try to put too many appliances on inadequate wiring. I had an electrician come in and hook up a separate dedicated circuit for the room." His electric bill is high -- each of his six grow-lights draws a kilowatt per hour -- but he doesn't really worry about PG&E turning him in. "If you're paying for your power that's all they care about. I've talked to many people who have three- to six-light [growing operations] in their places -- and we're talking scores of people -- and it never comes up," he said. "You pay your bill. It might be $500 to $800 a month for electricity. "I've talked to lawyers and have never heard of a case coming to trial based on PG&E reporting someone for using too much power." According to PG&E spokesman Lloyd Coker, called at his Santa Rosa office, customer billing data is privileged information. "If the cops call me tonight and say `I need you to tell me if so-and-so's bill is a lot higher; we suspect he may be growing marijuana,' we say, `I'm sorry, we can't give you that information, because all those customer accounts are confidential,'" Coker said. "If it's a criminal investigation, they can subpoena the PG&E information and I imagine there's a way we will cooperate. I just don't know to what degree because of the confidentiality that is inherent in customer accounts." Sheriff Lewis said often times a grower using a commercial power source may bypass the meter so the utility doesn't know. But does PG&E automatically inform law enforcement when they catch someone stealing power? "Absolutely not," said Coker. "We want to be certain without a doubt that there is diversion of electricity going on. We enlist the help of the local police agency if we need to [but] often a simple letter will suffice: `Hey, we noticed some discrepancies here,' and often that will straighten things out. We'll send them a back bill, it gets paid, nobody says anything, everyone goes away happy." Mr. G said it's true that some growers steal power, but it's not only unnecessary, it's unwise. "It's a felony -- grand larceny. And it's actually an added enhancement [additional charges] if you ever get busted." Of course, getting busted is a concern for Mr. G but he doesn't seem overly worried about it. "The scale we're talking about here, it's practically legal. People who get busted for having a few lights rarely do any prison time. They get probation or drug diversion, especially if it's their first offense. "Since I have never been arrested, I look at it like this: I have one free try. If I get popped I have to stop because I'm not going to risk my freedom. But the way the law is now, if you can afford to hire a lawyer, the first offense is just a slap on the wrist. You get to walk away and pick up your life." He doesn't take the possibility of discovery lightly. One concern is drawing the attention of the IRS. He avoids conspicuous purchases. He doesn't drive a brand new car or truck, even though he can afford one. And he still works, in part as a way to explain the money he makes. "One thing I do is deposit a certain amount in the bank every month and declare it as earnings," he said. "I do the estimated tax thing and pay taxes on what I deposit. I suppose if I was audited it might go bad against me but again I try to keep a low profile." Another precaution is a reduction in the number of plants he grows. "There are two schools of thought on plant numbers. One is called `sea of green.' You basically fill your area with as many plants as you can. I used to have 300 growing very close together under six lights. I would only grow them 8 inches high before I would induce them to flower. After experimenting, I reduced the number to less than 100. "I don't have any concrete evidence about it, but the rumor is the feds are less likely to prosecute you if you have under 100 plants. If you get busted for this, you don't want to be federally prosecuted. Federal sentencing guidelines are more stringent. They throw the book at you." One hundred plants might seem like a lot, but according to attorney Harris, even 300 could be considered small potatoes. "The DEA's position has been that if it is under 1,000 plants, they're not interested," Harris said. "That comes with a caveat: There can be other reasons the feds will become interested. If weapons or other types of drugs were involved, or a high level of sophistication." Lewis agreed. "Prior to being elected sheriff, I was a DA investigator for many years, and one of my assignments there was narcotics," he said. "At one point, the federal prosecutor's standard was exactly what [Mr. G] said -- 100 plants. If there were fewer than 100 plants, they would decline," he said. "[Today] that is well below what they would normally prosecute. That's not to say they can not or will not prosecute. But as a general rule, they're not interested in grows smaller than 1,000 plants." Even if the federal authorities are not interested, cultivation and possession of marijuana for sale is still a felony. And Harris points out, "A felony is never a slap on the wrist. There are times when a sentence may not include jail time, but it may include a large amount of community service or some work-alternative program. I think the fear for most people is the felon status." Mr. G said he is aware of the risks. "I've seen people go down. I've seen what happens. They go to jail for a couple of days. They make bail. They go to court a bunch of times and it's resolved, usually with drug diversion or a suspended sentence or sometimes an actual sentence of a year or two. I'm not saying there's no risk. There's a certain dread that I have to live with. But I'm willing to take the risk for the rewards." And in a show of entrepreneurial spirit, Mr. G is making it possible for his friends to also reap those rewards, even if they don't have the capital for a grow-room startup. "It takes an investment of $3,000 to $4,000 for the equipment and other things you need to start a small operation," he said. "I offer a deal. I set them up with a grow room and I get half the profits for a year, then it's theirs. Over the year I teach them how to do it and do part of the work. Once they have it down, all I have to do is stop by and collect my cut." Mr. G says the number of people getting involved in the business is increasing. "I think there are a tons of people doing it. 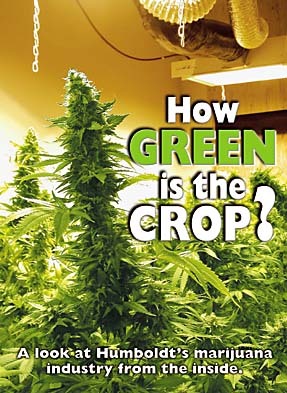 Of course, I have the point of view of a grower, so I assume if I'm doing it and it's this easy, everybody must be doing it." But he said there is other evidence of indoor growing's popularity. "You see the stores in every town [stores that offer nothing but growing supplies], not to mention the fact that all the nurseries have an area for products designed specifically for pot cultivation," Mr. G said. "You don't use bat guano on your tomatoes. Maybe some people do, but it's expensive. If you ask for bat guano you get a wink. They know what you're using it for." "I don't see that the law enforcement effort does anything to diminish that temptation for folks [to grow pot]," said Harris. "I think if anything [CAMP] tends to drive the price up, making the temptation greater." The officer in Fortuna said he has observed indoor operations getting larger and slicker. "People who have done it for awhile are getting more sophisticated and when that happens, they are able to move the size up a bit. And hey, the economy's not very good right now either and people need to supplement their incomes. I expect to see even more in the coming years." The Journal: How much finished product does a grow produce? Mr. G: The industry standard is a pound per 1,000 watts of light in about 10 weeks. 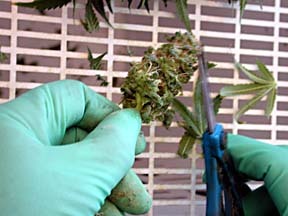 If you have a fresh batch of clones ready to go when you harvest, you can conceivably get a harvest every eight weeks. Where do these clones come from? Some people are in the business of selling clones. That's all they do. They'll grow a few nice-sized plants and take cuttings off of them. They put them in little trays and they take root. It's just like any houseplant. You can buy them for between $5 and $12 a clone on average. Some people ask $20 for one clone, usually because it's a good strain. What is "a good strain"? Just like with vegetables or dogs, you breed for specific things. The trade-off is that the super potent quality pot generally produces less quantity. High yield strains don't have the same quality. You look for a balance. 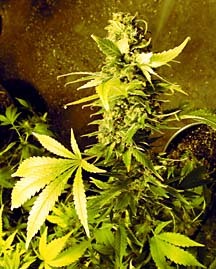 Some of the popular ones are Northern Lights. It's been around for a long time. There's one called Big Bud, Skunk No. 1 and No. 2, Snow and White Widow. Those are all ones you can get from Amsterdam seed banks. Pot is legal in Holland so people grow the seeds and deliver them to the bank and they mail them out. The postal service confiscates some, but a lot go through. I tried different varieties. The one I'm happiest with is Northern Lights, bred specifically for indoor growing. Is there some advantage to growing outdoors? Sure. An important one is you can grow on federal land instead of on your own property. When you're growing in your bedroom it's pretty hard to deny that you knew the plants were there. And there are certain qualitative differences in the buds. Some prefer the flavor of outdoor. It looks a little different. It's gnarlier, it's thicker and more robust-looking than indoor. There's definitely a market for it. When harvest season comes around people are clamoring for it and, in fact, indoor product becomes harder to sell. 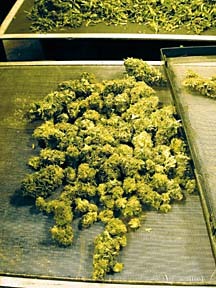 But after the harvest flush is over and people have smoked up all the outdoor, they come back around to indoor. How do think your business fits in with the local economy? I buy growing supplies at local stores and of course I spend other money locally. And I'm also an employer. I hire people to do the processing. Manicuring is quite labor intensive so I hire that out. There's a community of people who are known as good clippers. Some support themselves entirely by going from one operation to another. With all the indoor operations there's work year 'round. It's generally piece rate at $200 a pound and on average you can do an ounce per hour. That works out to about $12.50 an hour cash. It used to be lower but it has come up. With the clippers working for many different people they can set the price to some extent. Are you involved on the retail side? Not at all. It's unwise for a grower to be a dealer. I have a buyer who comes by every couple of months and takes all I've got. You don't want to be known as a pot guy. You want to keep a low profile. I have a job, I work. I'm seen in the community as a working class stiff, I don't want to be known as someone who sells pot. With a six-light scene I grow, conservatively, six pounds every three months. That's four harvests a year for 24 pounds a year. Multiply that by $4,000 and you get around $100,000 -- cash. Then there's more from the people I set up with grows. I make plenty. WHILE SOME GROWERS HAVE MOVED INSIDE to avoid discovery by law enforcement, many have not. That's why this year -- as every year for the past decade -- has brought another season in Humboldt County for the Campaign Against Marijuana Planting. Depending on whom you ask, CAMP is either making Southern Humboldt a hard place to grow pot or just a hard place to live. Law enforcement officials say the joint state and county marijuana eradication program cuts the amount of marijuana harvested in Humboldt County and deprives growers of tens of millions of dollars. Some residents, however, see CAMP as an invading army in their own backyards. Complaints range from horses being spooked by low helicopter overflights to allegations of warrantless searches. The result is an atmosphere in which many citizens do not trust the law enforcement organizations charged with protecting them. "People in Southern Humboldt County do not trust the sheriff based on the way marijuana is handled," said Mark Harris, an attorney whose practice consists exclusively of marijuana defense. He said there are "quite a number of regions in the county where the last person someone thinks to call if there's a problem is the sheriff." And suspicion is a two-way street. "I've had CAMP agents on the stand testify that they regard people in Southern Humboldt as suspects as a general rule -- just because they live in a rural area in Southern Humboldt," Harris said. "There's a clash between that culture out there in the hills and law enforcement in general." Running parallel to the decade-long fight about how appropriate CAMP's tactics are is another debate over whether the program even works. While CAMP destroyed 15,360 plants in Humboldt County last year, Harris said it remains unclear whether that meant any less pot was hitting the market. "The season begins, the helicopters fly, people try to document a host of civil rights violations, the season ends. The season begins next year and the same thing happens again. I have not seen any change in the level of marijuana use or planting in the county," Harris said. "There's a sense of futility." That's not how law enforcement sees it. 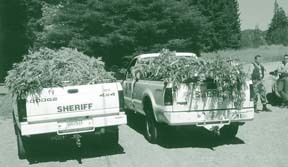 Humboldt County Sheriff Dennis Lewis said he believed CAMP has done "a fairly effective job [on reducing] the outdoor grows" and had forced marijuana cultivation indoors (see cover story). CAMP found 100 outdoor gardens last year alone. Those who still grow outside constitute a uniquely old-fashioned class of small growers, said Mike Van Winkel, spokesperson for CAMP. In a telephone interview from Sacramento, Van Winkel said that of all the places CAMP goes to eradicate pot every year, the North Coast is the only location that still harbors the old-fashioned "mom and pop" grows. "Growers in Humboldt and Mendocino tend to be traditional: owner-operated with a couple hundred plants being considered a big grow. That pales in comparison to the Bay Area or the Sierra foothills, where grows are in the tens of thousands," he said. Marijuana eradication may be headed for a shakeup in Humboldt County, however. In past years, the Board of Supervisors has accepted CAMP funds with a 3-2 vote. Fifth District Supervisor Paul Kirk, a CAMP supporter, is not seeking re-election next March. That opens the field to a candidate who may think differently about CAMP. "If the helicopters fly over people's houses more than once during each year's campaign, I'm not for that," said Vic Taylor, who is running for Kirk's seat. Taylor, a data collection and program compliance supervisor with the county, said he supports marijuana eradication in principle, but doesn't want drug policy to create "a war zone for innocent civilians." There may be as many as six or more candidates for Kirk's seat and others are very pro-CAMP. "I support CAMP," said Ben Shepard, a retired teacher who announced his candidacy Nov. 5. He said he has good reason to. As a rural landowner, he had to call CAMP to destroy gardens he discovered on his own land. "If there were no CAMP program, I feel gardens would be more prevalent," Shepard said.